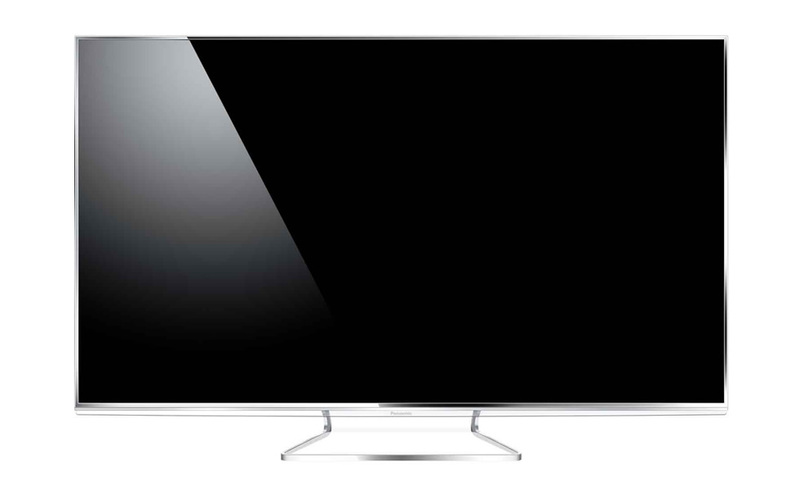 This is the L47WT65, Panasonic’s flagship 3D LCD TV with its minimalist floating design. But don’t let it’s nothing-but-screen appearance deceive you into thinking this is a pared back TV. 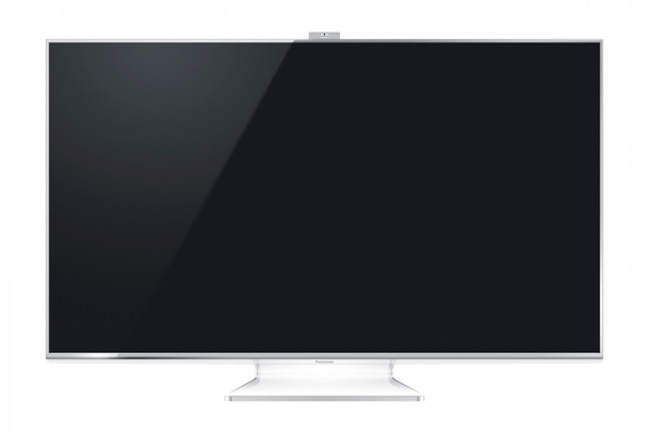 Panasonic have brought in a whole host of network-enabled apps and clever peripherals to make this a truly connected TV. The L47WT65 is beautifully designed. 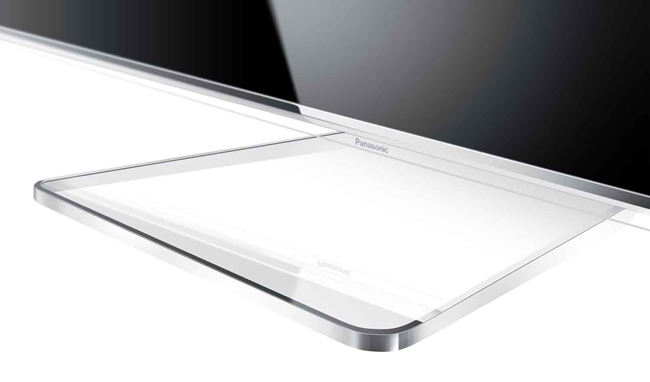 Panasonic’s design and engineering teams have created a design featuring an invisible bevel and the stand cleverly disappears into the background leaving you with a huge floating screen. All along the bottom edge is a transparent panel which lights up when the TV is switched on – revealing the power light and Panasonic logo which creates a nice effect when the lights in the room are dimmed. Further reinforcing the minimalist design is the chrome stand which impossibly keeps the screen propped up. Using 16 LED light clusters, the L47WT65 is able to render a high contrast image to reproduce bright, vivid colours and deep blacks. This is done by dynamically adjusting each of the lighting zones to deliver a crisp picture. An impressive 3600Hz panel display system means you’ll get a motion reproduction without juddering or lag and this really makes a difference when viewing high-action content. There are a number of elements which make up Panasonic’s Hexa image processing engine. These include noise reduction, colour control and ambient light sensing which are all designed to deliver the best image quality in any environment, however these can be adjusted and mostly toned down or switched off. Although 3D hasn’t taken off, manufacturers still continue to include this capability. The L47WT65 comes with passive 3D technology and comes with four polarised spectacles in the box. A common problem with panels that are designed to be thin is that they often come up short in the audio department. Sound quality on the L47WT65 is average at best, lacking in any oomph in the bass department which can at times come across as tinny sounding. Whilst this is fine for normal television programming, you’ll want to consider a separate speaker system if you want to make the most of enjoying a movie. 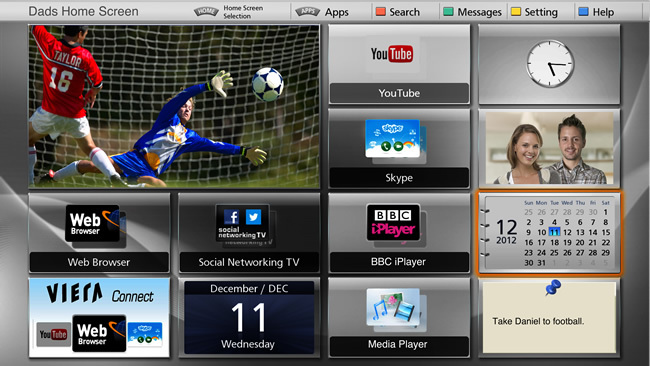 Panasonic’s new on-screen interface is designed to be customisable and adaptable to individual users. You can move between these screens using the remote or through the face recognition system. The built-in camera is neatly integrated into the panel and only pops up when it’s needed. A number of different layouts are available for creating individual home screens where you can attach your favourite apps and a number of widgets for an at-a-glance view of the weather, clock and calendar. Using VIERA Connect, you can download apps for accessing online content. 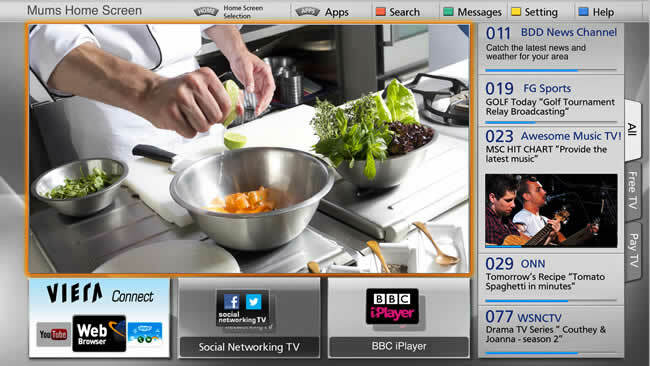 Some of the most popular apps are available such as iPlayer, Netflix, YouTube and Skype. However there are a few noticeably missing ones from ITV and 4oD. It’s interesting to see that the L47WT65 comes with two remotes. One is a more traditional one littered with buttons. 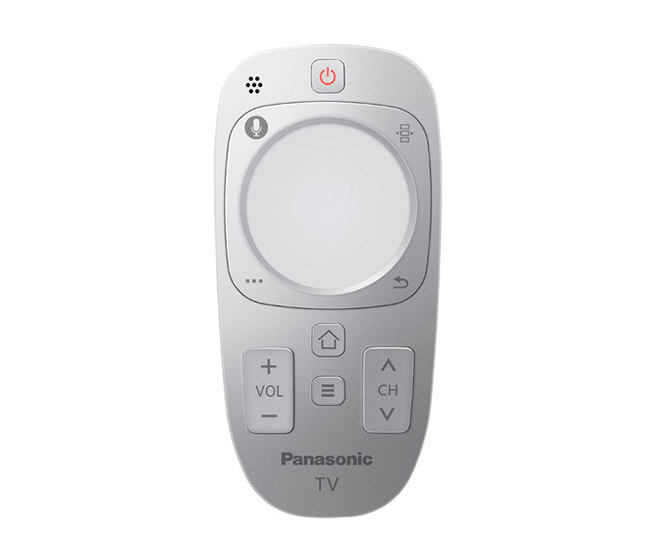 The second remote contains a trackpad and microphone which make voice control and web browsing possible. Along the top of the L47WT65 is a neatly hidden camera which pops up only when it’s needed. The usual array of connectivity is included on the L47WT65, including WiFi and Ethernet for internet connectivity and media streaming across your home network. The three HDMI ports are complemented by three USB ports which allow you to connect a hard drive for video playback and recording. Codec and format support is on par with competing panels and will comfortably accept HD MKV, Xvid and DivX files. Dual tuners are built-in for Freeview HD and Freesat HD which when combined with a USB-connected hard drive will give you the ability to watch one channel whilst recording another. Using the Viera remote 2 app, you can send send the video from the second tuner out to your iOS or Android smartphone/tablet. Excellent picture quality and clever design are what make the Panasonic Viera L47WT65 a worthy contender against the likes of Samsung and Sony. Panasonic have made some big strides in feature-matching with its competitors however part of me wonders whether they could have produced a TV set that’s just as good without some of the extra gimmicks like face recognition or voice control. There’s currently two promotions running for the L47WT65 and other Panasonic TVs where you can claim a free 16GB iPad 2 and a 5-year warranty.